Faithful Red Ramekin readers might remember my post a few months ago on granola. Homemade granola, to be exact. 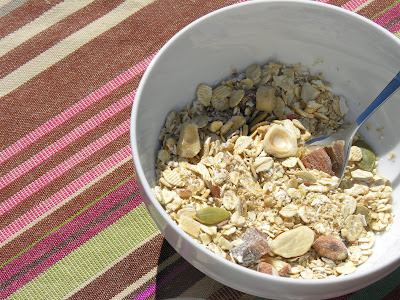 For some reason, I was on a granola-making kick, and was in search of a recipe that was both tasty and not loaded with fat and sugar (it is a breakfast food, after all). I experimented with blueberry granola, peanut butter-banana granola, even pumpkin pie granola. They were pretty good, but the texture wasn't quite right, and the flavor was sometimes a bit...off. Probably because there wasn't enough fat or sugar. However, making oatmeal and toasting bread are wholly un-interesting, and especially now, when the weather is a bit warmer, I like cold cereal with milk. And then, last week, while I was roaming Whole Foods in search of culinary inspiration (as I often do), it dawned on me: Swiss-style muesli. Actually, there is a bulk bin at Whole Foods full of "Swiss-style muesli," and the ingredients - rolled oats, wheat flakes, oat bran, raisins, dates, sunflower seeds, hazelnuts, wheat germ - are right up my aisle. I treated myself to a whole dollar or so worth of the stuff, and it wasn't too bad. It has no added fats or sweeteners, relying on the chewy goodness of the dried fruit and the pleasing wholesomeness of the nuts and seeds for flavor. Because I'm never satisfied with just filling up a bag of something for breakfast, though, I embarked on my own muesli-making adventure. All that making one's own muesli entails is mixing a bunch of healthy things together, and it allows for a personalized combination of said healthy things. I added almonds in addition to hazelnuts, stuck with the dates and raisins but added some chopped dried pears ($3.69 per bag at Trader Joe's, and my new favorite dried fruit), and substituted the sunflower seeds for some roasted pepitas. For the grain base, I used rolled oats, rolled barley, oat bran, and wheat germ. I found that the only secret to making delicious muesli is toasting the ingredients before mixing them all together. First, I toasted the nuts and the pumpkin seeds until lightly browned and fragrant. Then, I toasted my grains for just a few minutes, to enhance their flavor and texture. Whole Foods clearly skips this step, because my muesli was much more flavorful than theirs. Ha. My other trick was dumping the oats and barley in the food processor and giving them a few good pulses before roasting. Having some tiny bits of grain mixed with the larger flakes is better for milk-absorption. 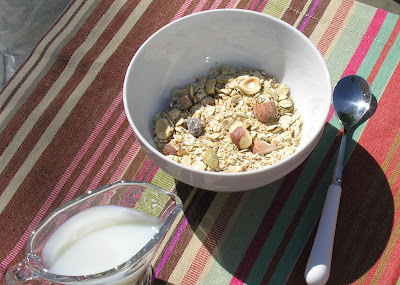 Chopping the nuts and fruit into smaller pieces also helps create a more even and integrated flavor in the cereal, although leaving a few larger chunks is good for textural and visual appeal. 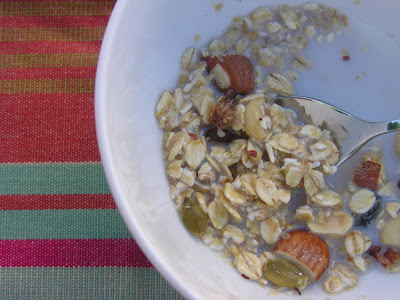 Making your own muesli takes a bit more effort than filling up a bag at the bulk bins, but really not much more effort than making oatmeal in the morning. 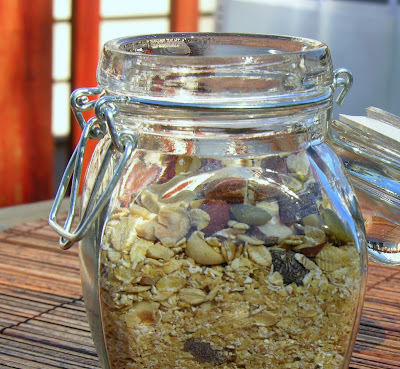 You can make a big batch and store it indefinitely in an airtight container or zip-top plastic bag. The proportions listed here are approximate and reflect my preferences, but mix it up according to your tastes. When serving, let it sit for a bit in some milk or yogurt, so the grains can soften and plump up. Final verdict: better, easier, and healthier than granola (although the Whole Foods ginger granola makes quite a tasty mid-shopping snack). Toast nuts and pepitas in the oven (at 325F or so) until lightly browned and toasty-smelling, about 6-10 minutes. Meanwhile, process the oats and barley: place in the bowl of a food processor and pulse several times until some of the grains are almost powdery, but many whole flakes still remain. Once processed, dump the grains onto a lined baking sheet with the oat bran and wheat germ, and toast in the oven for just a few minutes. The grains should smell slightly toasted, but shouldn't be brown. If using whole dried dates, chop into small bits, separate the pieces, and coat in some of the grains to reduce stickiness. Chop pears into small pieces. Once the nuts are slightly cooled, chop them roughly. Mix grains, nuts, and fruit, and mix thoroughly. Allow to cool completely, and store in an airtight container. Try using dried currants instead of raisins. I always preferred them because they are smaller, so spread out more evenly in each bite. Try adding Goji berries! Knocks up the nutrition a couple of notches!